The Goodman Games site is one of my regular stopping points on the web. The company’s well known as an imagination factory that produces some of the most innovative and entertaining game supplements in print today. It’s also home of the popular Dungeon Crawl Classics role-playing game. What it’s never been until now is a purveyor of Weird Tales, so I was intrigued when I discovered five facsimile issues of the famous magazine were available for purchase on the site. I wrote publisher Joseph Goodman and asked him what this availability signified. As I should have guessed, it involved Appendix N, Gary Gygax’s famed recommended reading list printed at the back of the original Dungeon Master’s Guide (from Advanced Dungeons & Dragons, if you’re not a gamer). For those not in the know, that appendix launched a generation into the exploration of fantasy fiction, from Anderson to Zelazny. It was an immense influence on gamers and future writers alike and something Joseph Goodman has used as a touchstone for both the creation of adventures and the design of the Dungeon Crawl Classics game itself. Here’s what he had to say. Howard: Let me get right to the chase — why are you reprinting Weird Tales? Joseph: In many ways, Weird Tales is “a magazine that can inspire D&D adventures.” Weird Tales is special because so many of the early Appendix N authors make appearances: Robert E. Howard and H.P. Lovecraft are in nearly every issue for a several-year stretch. Others, such as Jack Williamson, Manly Wade Williamson and August Derleth, also appear frequently. And Clark Ashton Smith, “who should have been in Appendix N” (and did appear in subsequent lists of inspirational fiction that Gygax prepared, leaving some to conclude he was accidentally excluded from Appendix N), also appears regularly. The specific issues chosen so far have a good concentration of popular Appendix N authors and/or iconic cover art. Fans of fantasy art also have reason to look at these titles. The “father of fantasy art,” John Allen St. John, illustrated many Weird Tales covers. Another equally important illustrator is Margaret Brundage. She was the first artist to illustrate Conan, and that illustration appeared on the cover of Weird Tales. It’s notable for many reasons: Conan himself is definitely not Schwarzenggar-esque in her illustration. He’s more of a tall, lithe, well-rounded athlete than a weight lifter. And the fact that Conan’s first illustrator is a woman is important to many historians. 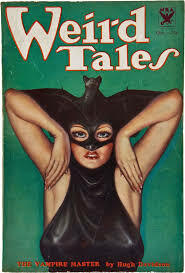 Brundage went on to fame (or infamy) with her many Weird Tales covers featuring scantily-clad women, and her legendary “bat-woman” image. Joseph Goodman running a DCC game at Pacificon Game Expo. Wait, you said “issues chosen so far.” Does that mean you’ll be reprinting others? Yes! In general I have been seeking out vintage fantasy magazines that include Appendix N fiction. I have 7 more issues of Weird Tales already queued up for reprints; these should be on the site by late January. I also have two issues of Strange Tales. 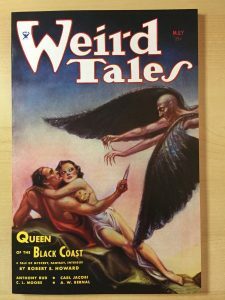 While Weird Tales is special in many ways, it’s also noticeably lacking for some Appendix N authors. Abraham Merritt had only one story in Weird Tales, for example, and Edgar Rice Burroughs didn’t have any. I’m also researching reprints that could cover these and other Appendix N authors. This is starting to sound pretty cool. Where is this going in the long run? I eventually want to start selling Appendix N fiction on my site. Many DCC fans also read fantasy and science fiction. Some have even started Appendix N book clubs! 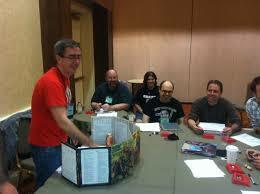 We did a seminar at Gen Con last year on Appendix N fiction and it was also well received. So I believe there’s interest in finding this “vintage fiction” in some form. For now this is intended to round out the experience of DCC players. But who knows, down the road it may reach a new audience. For more information on Goodman Games products, along with those Weird Tales reprints, click here. Intriguing, though at that price point insufficiently so. Yeah, the price is a bit steep, but this is still a nice thing to see. You could read a relic in your easy chair and not worry about it falling into fragrant paper flakes in your hands. And there’s something great about a game company so keenly aware of D&D’s debt to the fantasy of the pulp era that they would do something like this.